NCS Expert 3.1.0 error code! - BMW forum. 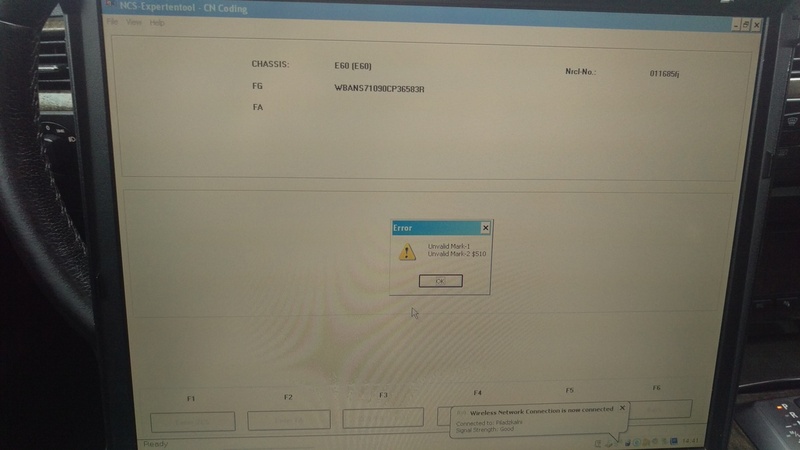 Diagnostics, coding, programming, repair BMW vehicles. So i`m trying to code folding mirrors,but with no sucess,with my bmw e61 2006. My NCS expert FOLDER is downloaded from link,where guys from another forum told,that it is working fine. (already tried diffrent version,same error appears). My steps are:Open NCS expert,load profile (revtor,or expertmode) ,press F1,then F3,coose CAS,and I get following error : "FOLLOWiNG FEATURE IS INVALID FOR: FA$510 "
So i cant read my car,can anyone know whats the problem? Last edited by Pichuks; 10-03-2017 at 02:44 PM. you wrote it is not clear what. Last edited by Pichuks; 10-03-2017 at 01:18 PM. I updated my daten files,vo V53 ,the same error apears. The problem is there that i cant even make a FSW file,to see the list of options. it doesnt matter wich ECU i choose,the error is the same. Maybe try to install ncs 4.0.1 with bmw standard tools 2.12?